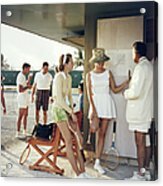 Tennis In The Bahamas by Slim Aarons - 11.875" x 12.000"
Tennis In The Bahamas framed print by Slim Aarons. Bring your print to life with hundreds of different frame and mat combinations. Our framed prints are assembled, packaged, and shipped by our expert framing staff and delivered "ready to hang" with pre-attached hanging wire, mounting hooks, and nails. There are no comments for Tennis In The Bahamas. Click here to post the first comment. 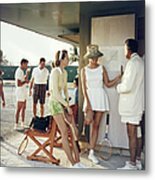 Two women stand talking to a man on the edge of a tennis court in the Bahamas, circa 1957. Behind the main group stand a second group of people talking. (Photo by Slim Aarons/Getty Images)Image provided by Getty Images.